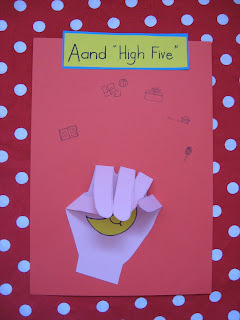 ...Joyful Mama's Place...: Making it Fun to Get Things Done: Morning and Evening High Fives! 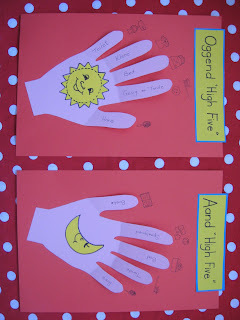 Making it Fun to Get Things Done: Morning and Evening High Fives! With the birth of our third baby about eight weeks away, this Mama is going into overdrive to get everything ready to ensure a smooth transition to becoming a family of five. One of the most pressing things for me is to get Sweetpea and ArrowBoy a little more motivated to help with getting ready for the day, and for bedtime. They are quite capable of doing quite a bit around the house already, and thrive on routine, but I thought a little encouragement might go a long way to help me cope with things once the littlest one arrives. 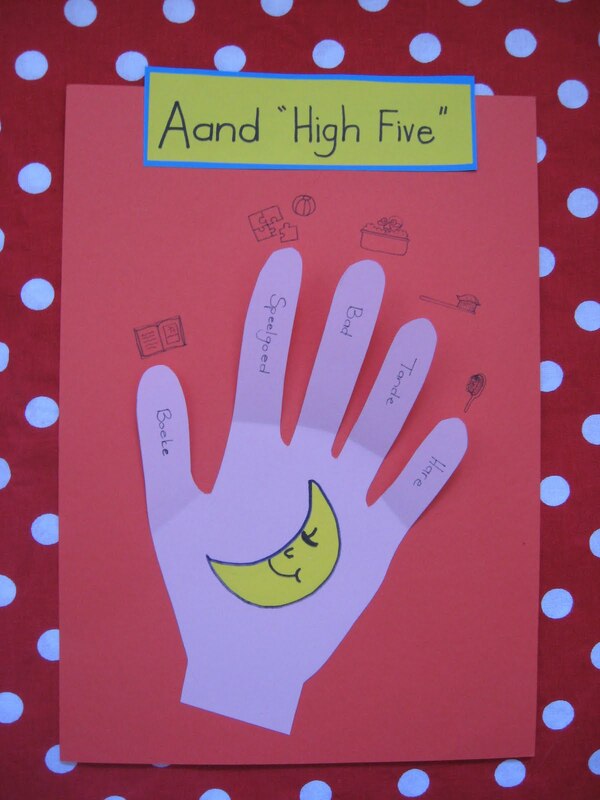 I recently saw a cute idea on Pinterest for creating a morning and evening 'High Five' chart and visited the blog where it originated, called Life as a Mom. 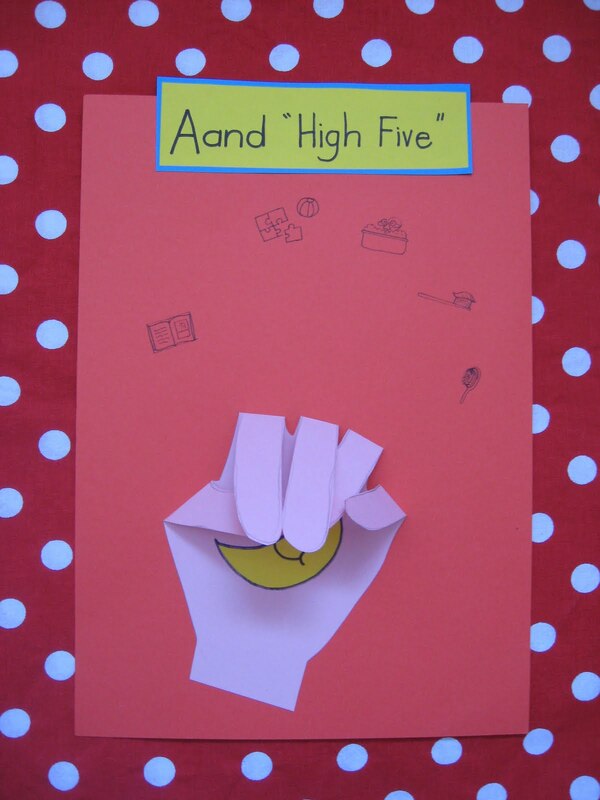 You can read about their system for getting things done, and see her High Five charts, here! 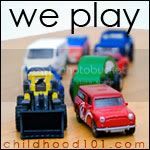 I adapted ours a little according to things my children are capable of and familiar with doing every morning and evening. Actually, mornings around here go pretty smoothly, except maybe for an occasional clash of wills between myself and Sweetpea when it comes to choice of outfit! Evening routines are also pretty set and the children are comfortable with it, but I inevitably end up exhausted from cleaning up their books and toys after they've gone to bed. That has got to change!! So, two of our evening High Five fingers will hopefully remind me to get them started on clearing away their things before supper! 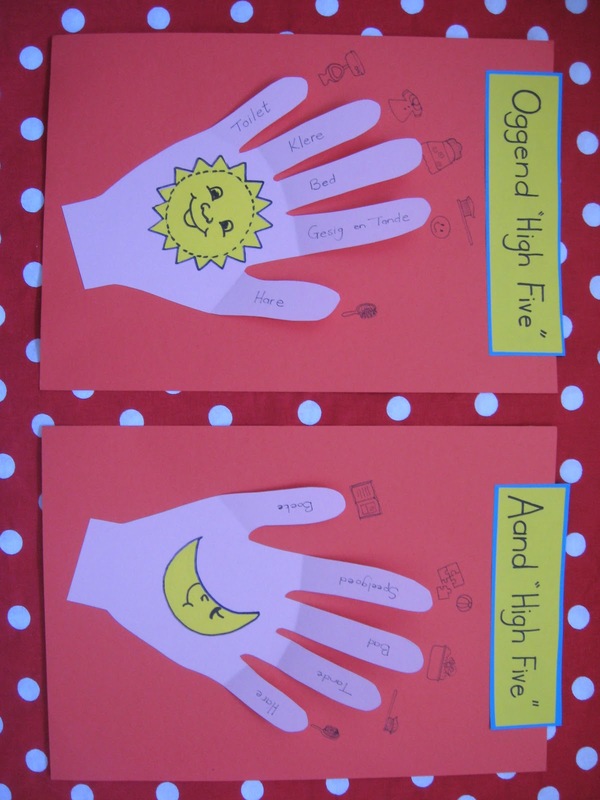 I didn't glue down the fingers on our charts, as I thought it would be fun for the little ones to 'unfold' the High Fives as they get things done. I also used visual clues for my little non-readers so that they don't need to have to ask what comes next. I only included the things they do on their own. Fixing them breakfast or putting them to bed with a story, are things I do for them, so they are not part of our charts. And can I confess a little something here? I actually really enjoy coming up with all kinds of nifty little ways to encourage my troop. Watch this space for more ideas of how I'd like to set my children up for success, and make it fun to get things done! What a lovely idea! I can imagine the excitement as they raise those fingers step by step until they see the celebratory High Five! I'm quite sure it's going to make the afternoon rush hour much easier. I love what you've done for the Morning/Evening High Five from "Life as a Mom". Such a cute idea! I love how you allow them to open each finger as they accomplish each job. I'm going to borrow your idea for my kiddos too!